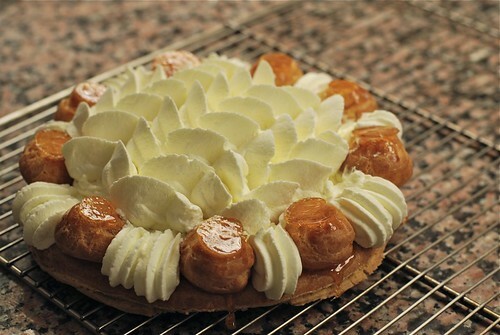 If you like whipped cream, then the very French dessert St-Honoré is totally for you. 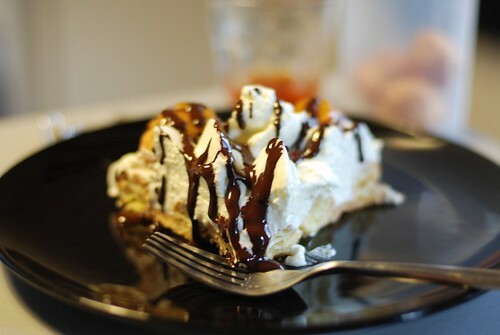 It is a crumbly cookie crust, with unfilled cream puffs dipped in caramelized sugar lining the edges, and then the rest of the gateau is just filled with sweetened whipped cream (crème Chantilly). Doesn’t sound too complex in terms of flavours, but it is to die for once you take a bite. We had a demonstration featuring St-Honoré and the Paris Brest, which is another cream-puff-like pastry (choux pastry) dessert, but it is normally filled with the very rich pastry cream (avert your eyes at the ingredients) instead of whipping cream. 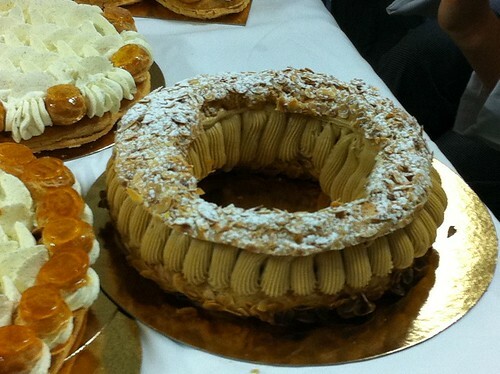 For the demo, the chef made a praline mousseline cream out of the pastry cream, which involved beating in even more butter, and filled his Paris Brest with that. I cannot use words to describe the sinfulness of the small tasting I got at the end of the demo. 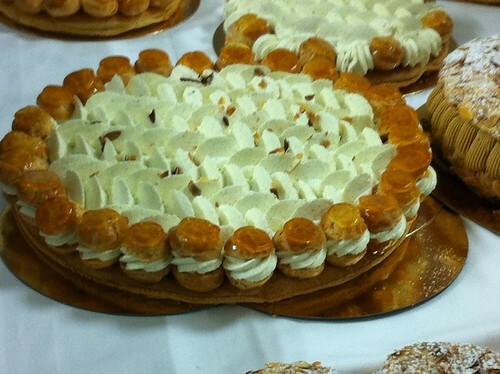 St-Honoré on the left, Paris Brest on the right, from demo, taken on my iPhone. 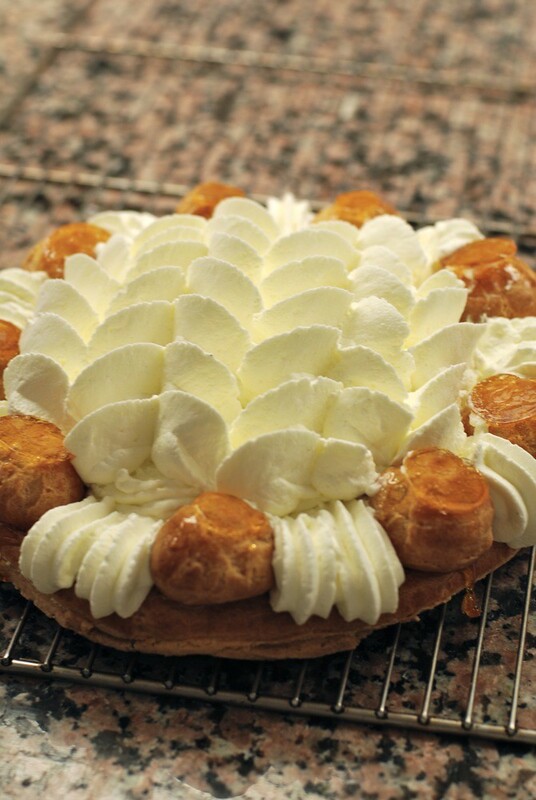 The components making up the St-Honoré were not extremely complex to make, but it was the first time we had so many moving parts in a practical. Of course, the final assembly was a crucial element, because if anything, this is one dessert that is a major feast for the eyes. I walked into the practical feeling anxious, since I had no idea how long everything could take. On the way in, a friend from a previous class warned us that the chef announced everything must be in the oven within the hour, which doesn’t sound like a lot of time, but should be enough. One hour for a rolled out cookie dough plus cream puffs? Ack! The class was hard, because the choux pastry needs to be overworked to develop gluten, and that was a lot of beating by hand. Then the whipping cream needed to be whipped, by hand, into whipped cream. Everyone was sweating profusely and looking up once in a while at each other in exasperation as the whipping took place. The countertop was also a bit high for most of us girls, and that made it even harder to whip. My cream started to thicken and was probably at a soft peak stage when I looked pleadingly at the chef as he strolled past me. He picked it up, started whipping slowly, and picked up speed just like a machine. Within 30 seconds I had a bowl full of whipped cream. It was not fair. I’m now going to stress about getting this dessert as part of my final exam. The best thing is, I don’t know what I did, but this chef really liked me. I was pleasantly surprised when he came by, helped me roll out my dough (which convinced me he was going to give me a zero for the day), and then gave me a squeeze and a high-five before he left. Um, what happened? He took time to get to know me too, (all en Français, which was kinda difficult), and we even got to talking about where I lived, how long it took to get to class, how he walks to school everyday, and how it’s good that I walk sometimes too, blah blah blah. I’m not sure if this was normal, or perhaps he’s just friendly to a couple of people at a time in different classes to make sure he gets to know everyone, or what…but it was really nice to have a super friendly chef who stopped by to pay compliments and to help out whenever I needed. It took the edge off of the millions of steps we had to go through yesterday (my recipe/notes were three pages long)! In total, I received two high-fives. Unheard of in the other serious chefs’ presence. 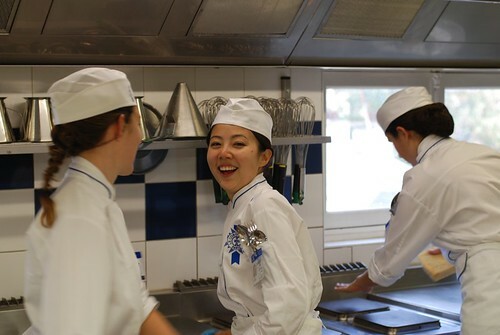 Photo taken by the chef – now you can see my nerdy self at work in my LCB outfit! I took the dessert home on the stifling hot Métro, and the cream was starting to go by the time I got home. We cut two generous pieces, took off the cream on top, and threw out the rest. Since I don’t like just whipped cream, I melted some chocolate and drizzled it on top before serving, and it was decadent and absolutely a dream to eat. It’s not something to be consumed everyday, but I’ll definitely remember this one for the special occasions! Drizzled with melted dark chocolate and consumed within seconds. This one is so fancy!! I love hearing your stories from the classroom! I feel like I’m gaining weight just looking at these deserts! PS LOVE you chef outfit! Next post: 300 grams of … Butter!